The goal of the 13 Series was to make a mouthpiece of Vandoren quality with the dark and centered sound of the legendary Chedeville mouthpieces that would suit American pitch (440 Hz) and the R13 Buffet clarinet, widely used in the United States. 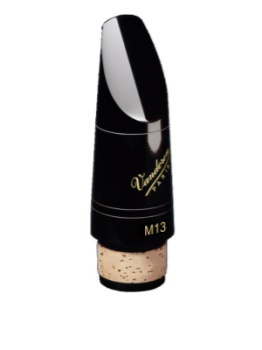 The M13 was the first mouthpiece produced in collaboration with Donald Montanaro. This mouthpiece has the narrowest tip opening in the Vandoren range, a slightly bigger chamber (a more hollow baffle) and a wider bore. In terms of sound, the M13 is the most brilliant; it has a small tip opening, a long facing, and a fine tip rail, for easy blowing, staccato and high-pitched harmonics.